Big agenda this week not just because a whole lot of comics came out, but also because we’re catching up from last week. That means forty-odd minutes of laconic drawlin’ ’bout Action Comics #881, Agents Of Atlas #11, Batman And Robin #4, Batman: Streets Of Gotham #4, Blackest Night #3, The Brave and the Bold #27, Captain America Reborn #3, Green Arrow & Black Canary #24, JSA Vs. Kobra #4, Marvels Project #2, Warlord #6, and Wednesday Comics #s 10 and 11. Download it here, listen to it via the player at right, or visit the podcast homepage here. Music, of course, is by R.E.M. Someday, several years from now, when Olivia Bondurant and her dad sit down to talk about Supergirl — as, inevitably, we will — she’ll bring up the Maid of Might’s less popular fashion choices. She’ll list the headband and perm of the ’80s, the bare midriff of the ’90s and ’00s, and the hot pants of the ’70s. And I will reply that yes, these were all rather unfortunate to one degree or another; but through it all, Supergirl could still serve up a beatdown. Hey, it’s June! Who knew? Lots of books this time, so no time for chit-chat. Obviously I spent a lot of time with Trinity #1 (written by Kurt Busiek, pencilled by Mark Bagley, inked by Art Thibert), so it wasn’t too bad, but OH DEAR LORD another scene of table talk! First Meltzer, then Dwayne McDuffie a couple of weeks ago, and now Busiek. I’m hoping this is the only such scene for, say, fifty issues. It’s not like the Four Horsemen miniseries felt the need to sit the Trinitarians down for a Continental breakfast. Other than that, I will say that I won’t mind spending the next year with Busiek and Bagley. For his first big DC outing, Bagley shows he has the chops to do the company’s most familiar characters. His Wonder Woman and Flash look especially good. I’m predisposed to like Busiek, so there you go. Once again I get the feeling that Star Trek: New Frontier #3 (written by Peter David, drawn by Stephen Thompson) would mean a lot more to me had I been reading the NF books. This issue’s plot features shocking! revelations about who’s being impersonated, or who might be impersonated. The last page had me particularly confused. Two issues to go, so I might as well stick with it. House Of Mystery #2 (written by Matthew Sturges, drawn by Luca Rossi) doesn’t spend a lot of time on the “nested” story (written by Bill Willingham), which is good. The nested story isn’t that compelling, despite some pretty Jill Thompson art. However, nothing much happens in the main story either. Its big emotional moment involves Fig, our heroine, discovering that she can’t leave the HoM, but we kinda already knew that. The secondary emotional moment, where she starts to spill her guts to one of the housemates and ends up berating him, also doesn’t ring quite true. The rest of the issue finds the housemates acting quirky without much to show for it. While I’d otherwise probably fault the book for being too broad, the characters haven’t distinguished themselves from one another yet. Mostly issue #2 was just Fig acting out against a bland backdrop. Much of Tor #2 (by Joe Kubert) is a flashback detailing Tor’s pre-issue-#1 journey, which is fine; but it gets a little loopy towards the end and eventually acknowledges that maybe those psychotropic leaves might be affecting it. As with issue #1, Tor fights a prehistoric monster in order to protect his new little friend. Accordingly, as with issue #1, I appreciated #2 for its craft, because who am I to criticize Joe Kubert? Besides, I have to get #3 to figure out what’s going on. I don’t have any strong feelings about issue #3 of Batman: Death Mask (by Yoshinori Natsume), so I’ll just say it’s nice for what it is — an above-average Legends of the Dark Knight-style story — and it is getting me used to reading manga. Learning can be fun! With her own title cancelled, Catwoman is more free to roam around the main line Bat-books, so the cover of Detective Comics #845 (written by Paul Dini, pencilled by Dustin Nguyen, inked by Derek Fridolfs) plays up her appearance. However, the story itself is a nice little whodunit which manages to withstand its conclusory leaps of logic. As such, it focuses on the Riddler, who’s been trying to upstage Batman at the whole consulting-detective thing. It also introduces a group who I can’t help but think is the Internet version of the old Mystery Analysts of Gotham City. The idea that Batman has a group of online buddies who only know him through a generic username is still a terribly appealing one, so if you like that, you’ll like this story. Rounding out this week’s Bat-books is Nightwing #145 (written by Peter J. Tomasi, pencilled by Rags Morales, inked by Michael Bair), an issue which starts to stretch the “Freefall” storyline past its point of usefulness. It wasn’t too long ago that Nightwing and Robin brought this particular storyline to a stop, but we’re apparently not done with it yet. The issue even appears to bring things back to that same point. Now, to be fair, this time around deals more with Talia al Ghul and Mother of Champions, incorporates Batman, and features the surprising return of another Bat-foe, but still. The concept of a mad scientist creating super-powered soldiers isn’t specific enough to Nightwing to warrant this much focus. At least Rags and Bair are back for the whole issue. 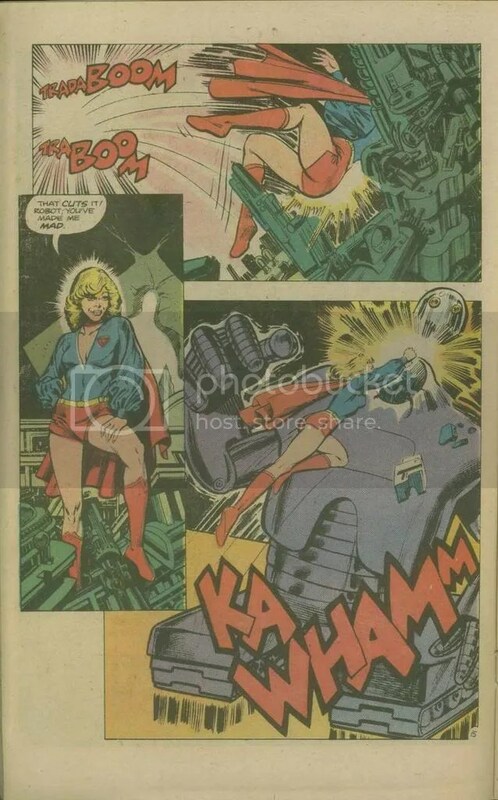 Speaking of which, Supergirl #30 finds relief artist Ron Randall drawing the whole issue, with Will Pfeifer taking the place of regular writer Kelley Puckett. Looks like a fill-in issue to me, but it’s not a bad one. It helps define the character in relation to Superman in a way which puts Puckett’s storyline in a much different perspective, and it even incorporates the Box O’ Universe from Puckett’s first issue. Randall’s art is clean and simple, although it flirts with being stiff and bland at times. Overall, though, the issue I enjoyed the most was Manhunter #31 (written by Marc Andreyko, drawn by Michael Gaydos). It’s the triumphant return of a title which has seen two long hiatuses (hiatii? ), so it opens with an efficient two-page recap of the character’s history. I’m not that familiar with Gaydos, but his work reminds me of early J.H. Williams, John Paul Leon, or maybe Tommy Lee Edwards — thick lines and lots of blacks. The main story does proportionately as well with its 20 pages. After opening with the requisite superhero battle, it reintroduces our heroine’s family and supporting cast, and through them sets up the current immigration-related arc. Last time I praised the new Action Comics for using its 22 pages well. This time, however, Manhunter really does a great job showing what a single issue can mean to a long-running superhero serial. High marks all around!